On time-traveling information and quantum mechanics. Screenshot from that Facebook-linked article you might have seen recently. I promptly rolled my eyes. Thinking, which ones? Because there are a lot of “scientific” studies of that ilk. One of my favorites (“favorite” here meaning “most laughably silly) is the psychology study demonstrating that people remember words better if they will study them after being quizzed as to which they remember. Which would be a neat trick — a kid could say, “Please, God, let me know the right answers on this test and I promise I’ll study the material as soon as I get home,” and it would work! It doesn’t. Of course not. What Bem demonstrated in his paper, “Feeling the future: Experimental evidence for anomalous retroactive influences on cognition and affect,” is that our current academic publishing system (wherein researchers are rewarded only for novel results, and particularly counter-intuitive novel results) is suboptimal for the real pursuit of scientific knowledge. If researchers are allowed to collect lots of data, analyze that data with statistical tests for p-values, and report only what works… then it’s easy to find counter-intuitive results. Those results will also generally be not true. 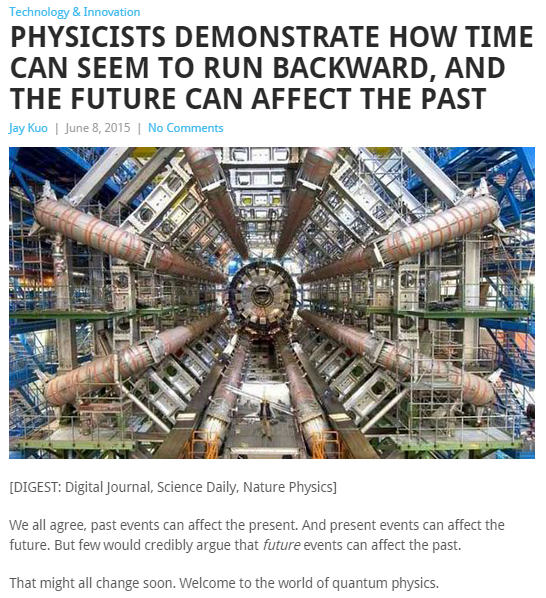 Anyway, that’s the kind of “science” I was expecting when K asked if I’d seen the new study on future events dictating the past. I was wrong. She was talking about a pretty standard quantum mechanics experiment, one postulated a few decades ago, conducted with photons in 2007, and conducted with helium atoms recently. The basic gist of why these are described as “mind blowing”: there are numerous results in quantum mechanics that can seem silly if you think of objects as being either particle or wave and somehow “choosing” which to be at any given time. Matter has a wave nature, and the behavior we think of as particle-like arises from the state of an object being linked to the state of other objects. The common phrasing for this is to say that observation causes a shift from wave-like to particle-like behavior, but the underlying explanation is that our observational techniques result in a state-restricting coupling. If you’re standing with your back to two narrow hallways (sufficient for only one person to walk through at a time) and a friend walks through and taps you on the shoulder, you won’t know which hallway your friend came through. Unless your friend tells you. Let’s just imagine that your friend is as cagey with his or her secrets as the average helium atom tends to be. 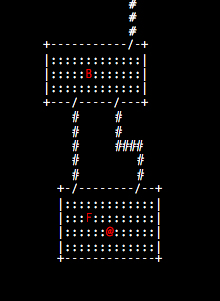 Here is a Roguelike diagram of our thought experiment… in case you haven’t played many roguelikes (for shame! You should try Brogue! ), you are the @, the F is your friend, the B is your buddy, and those octothorpes are single-person-wide hallways. If your friend then leaves, however, and at the same time a second buddy of yours walks through to tap you on the shoulder and say hello, then your friend’s history becomes coupled to this second buddy’s. If your friend walked through the northern hallway, your buddy had to be in the southern, and vice versa. Their positions are coupled because they can’t occupy the same space at the same time. If you never ask who walked where, though, there’s a residual probability that each walked through each hallway — and if you ever query one, because their histories are coupled, the other’s history suddenly snaps into focus. No matter how far away that second person might be. Learning which route either took tells you immediately about the other. Not that this information is necessarily useful. But perhaps you saw reports about faster-than-light-speed information travel between entangled objects. The above example applies just as well (or as poorly, if you’re a stickler for accuracy or truth or what have you) to those studies as well. A lot of results from quantum mechanics sound weird, but they don’t sound that weird in mathematics. Screen shot from Tim Wogan’s article. From a passage like that, it’d be hard to tell that this is an experiment that was first conducted nearly a decade ago, and a result that was exactly what you’d expect. Honestly, I had trouble even parsing the above paragraph, and could barely understand the experiment from the description given in the article. And I studied quantum mechanics! I spent my junior and senior years of college doing research in the field! (My research was on the electronic structure of DNA bases, not entanglement specifically, but still.) I don’t know how people without that background were supposed to follow the science here. Or get through it without their eyes glazing over. So, as to people’s excitement about this result: it’s a little bit weirder to think about the wavelength of big things (“big” here meaning the helium atoms; they’re big compared to photons), but it’s mostly weird in English. Or any other metaphor-based language. Our day-to-day perceptions don’t yield the metaphorical fodder we’d need to properly describe these phenomena in words. Because, yeah, I like to think that I’m sitting still in a chair, typing this. But I have a wavelength too. So do you. You might be anywhere within the boundaries roughly transcribed by your wavelength! And of course, there aren’t really any boundaries, because the probability of finding you in a place never quite drops to zero. Even if we consider locations far away from your moments-prior center of mass. But your probability peak on a likelihood vs. location graph is very, very steep. You, my friend, are rather large: your wavelength is very small. I don’t really like the use of the word “measurement” above (sure, I changed a few other words in that quotation, but only to improve readability — I didn’t want to change anything that might alter Wogan’s ideas), because to me this sounds excessively human-centric, as though quantum collapse couldn’t happen without us. Over time, the state of an object can become coupled to the states of others (if two blue billiard balls collide, for instance, then you know that at some point in time they were in the same place) or uncoupled from the states of prior interaction partners (if one of those blue billiard balls then collides with a third red ball, the trajectories of the two blue balls will no longer be coupled). 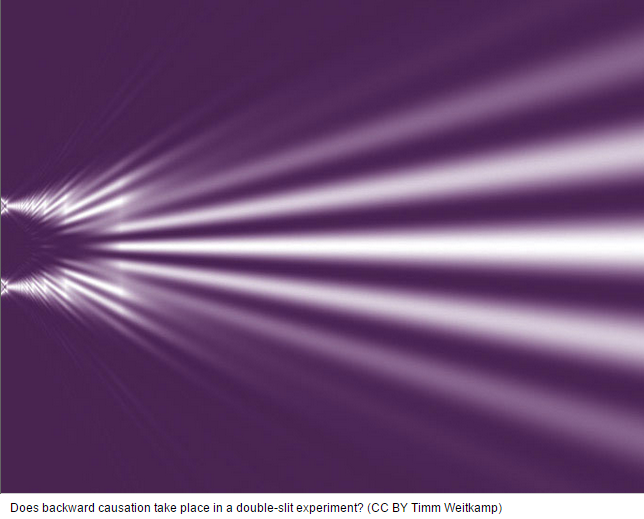 In this double-slit experiment, the coupling between helium atom and detector (when the detector either chirups or doesn’t, that making-sound-or-not state is coupled to the position of the helium atom) which unveils information about objects entangled with the helium. Maybe this seems less confusing if you think about it in terms of progressively revealing clues instead of causing behavior? But, again, the English descriptions are never going to exactly match the math.